AVFX, based in Boston, MA, began as most small businesses do, starting with the small jobs and moving into the more high profiles ones as word spread. Now, around 30 years later, AVFX has established itself as a fixture in the Boston area, as well as Internationally, through quality work and branding. 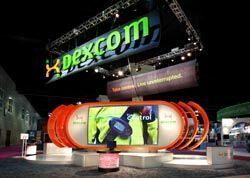 AVFX assisted Dexcom in putting together its booth for a recent tradeshow.Murray Lapides, AVFX's president, explains his company's history by saying, "This is American small business at it's best. I started the company in late 1970's, originally known as Media One. In the latter part of the 1980's we changed to AVFX, primarily because there was a cable company called Media One, so we wanted to differentiate from them." To keep up with the bigger companies, Lapides noted that staying on top of technology is key. "You always have to figure that what we do has stayed the same over the years. The tools have changed, and it's always a matter of adapting and upgrading to those new tools. I think one of our strengths is we've always been able to identify where the trends are going. In my position I'm always looking at what's a trend or a fad. I think we've been very good at identifying the trends and staying away from the fads." AVFX gear is based on its future need, as Lapides mentioned. "Our clients don't ask for specific gear by name, they ask for a look or desire. They tell us what they want us to do and we provide gear to do that. Our goal is to provide what the client needs, not the buzz name brand they think they need. In terms of prioritizing purchases, we try to look ahead, in the same terms of identifying between a trend and a fad. We look at the convergence of all the gear and technologies, and that's what most drives our purchasing." Murray Lapides, president of AVFX, says staying on technology is the key to this industry. One such trend that Lapides identified many years ago was the advent of computer technology and its effect on AV. "We realized that computers would eventually be the primary media delivery device. So we built a computer department 15 years ago, not so much to be a computer rental department, but the run Powerpoint, media players, and those types of programs." Lapides also saw a market for plasmas before they had really caught on in the industry. "We were also the U.S. launch customer for seamless plasma screens. That was something we saw and instantly realized it's potential and what it would do to the trade show and staging business. Those types of things we've lead the industry in." AVFX is a small company that has its fingers in many bowls, as Lapides explained. "We're a regional company with a national client base. We're in an office in Boston, doing work all over the country and in some cases internationally. There are 30 people on staff in the office, and many other technicians all over the country. If you look at our business, it's evenly divided between tradeshows and corporate meetings. Market segments of those are usually medical, financial services, some pharmaceutical. Surprisingly enough, social events, like charity balls, have become a huge growth area nationwide. This is mainly because these charity events, which used to be run by a doctor's wife or someone similar, are now hiring professional planners to get the contributions up to where they're needed." AVFX takes a more theatrical approach to its shows, as Lapides noted. "The end result is the same, so we approach all markets the same. We walk into a hotel ballroom or a convention center, and our goal is to get lights and sound and video up on the screen. I look at it in a theatrical sense. A producer or event planner is trying to illicit an emotional response from the audience and they hire us to provide the technology to illicit that emotional response. In my mind there's very little difference between a tradeshow audience and a corporate event audience, you're still trying to illicit that response. Everyone's talking about branding these days, and this is a means of establishing your branding." For more information visit www.avfx.com. @cap:AVFX provided support for Philips' booth at a recent tradeshow.